What is the tournament and how would you go about acquiring one of these? Ugh why would they use that horrible model. as has been mentioned in so many other item's comments, Wowhead does not get every new item model at once. Many items on the PTR site of wowhead use placeholder models. Please do not assume that this is the final model for the game, as it more than likely isn't. -EVERYTHING- on the PTR is subject to change at any given moment. just give the people at wowhead some time to update the models. Given what we've seen in Wrath of the Lich King so far, I would not be surprised if these 'placeholder' models become permanent. It's called well known fact wrath was gonna start off using old item models with naxx and all. the place holders for 3.1 are very quickly vanishing and being replaced with some killer item model's so patiance time will tell the tale. I have yet to see reskins in the new model updates. so relax and wait for what might just be a badass looking sword who knows! The New model's up, and ain't she a beaut? I was expecting a little more like the old Sin'dorei warblade, but still nice! *WoW* Hello new model you and i will be good freinds looks pretty classic a look to me but a lil wild i love it! Looks like Flamestrike. . .
Don't suppose anyone can post a screenshot or link of what this thing looks like? Well i can c what Kenth1 is saying. U cant c the picture until u download adobe flash 10. when u click on veiw in 3-D it will probably tell u wen u dont have the adobe flash 10 installed it will tell u that and ask u if want to download it and if it has difficulty it will open a new tab 4 adobe flash 10 download. it is a easy download that is very very small in space whys. so far ive had no bad things happen so im pretty sure it was safe my computer didnt find anything bad so if u cant c the picture just install the adobe flash 10 and ur set. Woah, that's a nice blade. Maybe it's just me, but this appears to be the only Wotlk 2H sword model which actually looks like a sword, aside from the DK sword. I mean, what do we have? - Ugh, I don't know what to say for that. Two sticks on a stick? Definitely getting this. Looking at the item level, it won't be hard to get, and it has lore - associations with Blood Elves. A must have for every dedicated Sin'dorei Paladin or Hunter. Sorry for my crap. I just like the lore. Like how they came in spaceships? I don't see why any hunter wouldn't want to ninja this. Nobody mentioned where to get this sword. So does anyone know where I can get this beauty from? Kinda ironic it's a two-hander, considering (and counting out death knights) Blood elves have only one class that can use this in any way effectively, the Paladin.. Hunters can use two-handed swords, yeah, but we all know that hunters shouldn't be meleeing... Nor have +strenght gear. Well of course in lore they do have warriors, and what's to stop a warlock taking up a sword if not restricted by game rules, but - makes me a little bummed that I only have a belf priest and a rogue :/ Guess I COULD start leveling a DK but.. Uh anyway. I sure hope there will be more than just one race themed weapon available. I'm thinking of at least three types of weapons, stuff most classes can use - daggers I think are at least learnable by every class? And a staff is usable by most classes as well. This is an awesome looking weapon for us obsessed with how our character looks, especially from roleplaying point of view - such a shame that a select few of the blood elf race can equip it. Paired with either a TS Destroyer or Colossal Skull Clad Cleaver, this would make a pretty sweet pre-raid off-hand for a fury warrior. Especially considering how easy it is to get. The snazzy appearence dosen't hurt either. Ok first off what i think your forgetting is the WoW is a Fantasy based world, so wepon models will and in a lot of cases should, look exotic. Other than that, this sword is great for anyone who has just hit lvl 80 and doesn't want to spend or grind mats for weapons like Titansteel Destroyer. And just like Titansteel Destroyer, this weapon will be replaced by any of the Naxx 25 2H. Other than that it's a beautiful weapon and a great addition to the game. Blood elves seem to have the best sense of weapon design when it comes to aesthetics. The three signature weapons they've introduced into the game are some of the nicest weapon skins we've seen. There's the Sin'dorei Warblade, a popular and solid weapon available early in the game from Ghostlands. For Paladins specifically, there's the Blood-Tempered Ranseur, which while too fast to be terribly good, is typically stylish as one expects of the Blood Elves. And from Mechanar, while not necessarily of Blood Elf construction, it is certainly dropped by one of them, the infamous Sun Eater that evaded so many aspiring tanks during Burning Crusade. And now we have this beautiful weapon available from the tourney. I know, I know... The Destroyer has higher weapon damage and higher STR and +1 higher Stam... However when I actually tested this weapon out with the same Berserking enchant I had on my Destroyer, I found that my DPS and overall efficiency went up by a significant amount in PvP. Plus I was SO ready to get a flippin' sword instead of a mace... And since I'm not exactly into Raiding, this was a great solution for me. This weapon has a pretty awesome design too =P Good job Blizz! If anyone is wondering this sword takes 9 days of doing dailies to get. How is this sword for a Deatknight tank in comparison with the titansteel destroyer? Weapon speed is no longer as big of an issue as before the normalization. However, it still matters somewhat. I guess I'll explain it a bit here to inform others. Note that I'll be using 2-hander speeds in the normalization, but the same applies for any weapon, just that they have different normalized speeds. Disregarding special modifiers (presences, talents, ect), crits, misses, and all of those things, your weapon damage range, meaning white hits, is dependent upon 2 things, the damage range on your weapon itself and your attack power. Your attack power increases the DPS of your swings by a set amount, and through multiplying it by the speed (DPS * Attack speed = Damage, just another way to say Damage / Attack speed = DPS) of your weapon and then adding the result to the original damage range of your weapon, the total damage range of your white attacks is thus born. My white swings will hit between 740 to 840 damage. Note that all damage dealt by weapons have a "range" instead of a damage value. It means that your hits will lie between the max and min values barring glancing blows. Calculations of DPS are done using the average damage value. Let's take a slower weapon but keep the same weapon DPS and the same attack power: a 119-219 damage range weapon with 3.6 speed (46.9DPS). My white swings with this weapon will hit between 839 to 939 damage. As such, the speed of your weapon won't affect the DPS of your white attacks. Slower weapons deal more damage, but deal them slower. Faster weapons deal less damage, but deal them faster. Thus, only the DPS on your weapon and your attack power matter on white hits. Instant attacks, however, are a different issue. Instant attacks, as their name suggests, instantly deal a certain % of your weapon damage. However, do we simply take the weapon damage range and multiply by said percent? Before normalization, this was the case. Let's take the same two weapons and make them hit instantly for 100% of their damage. Weapon 1 with 3.2 speed will do (740+840)/2 = 790 damage on average. Weapon 2 with 3.6 speed will do (839+939)/2 = 889 damage on average. They now split the two parts of your swing damage. They took the damage contributed by your attack power and made them modify your instant attacks as if you're holding a 3.4 speed weapon no matter what weapon speed the weapon you actually are holding has. Your actual weapon speed, then, won't matter for your attack power. But, do you notice something that I haven't mentioned yet? The missing ingredient is the "base weapon damage." If two weapons have the same DPS, the slower weapon will always have a higher base weapon damage. Since base weapon damage is added to your instant attacks, slower weapons will mean higher damage. Again, let's take the same two weapons but normalize them. There you have it, the damage is normalized so that weapon speed won't matter for damage contribution from attack power, BUT the base weapon damage still matters. As such, when physical classes obtain a weapon, most of the time a slower weapon is better since they add a little bit extra to instant attacks. However, the real deciding factor is the base damage range of the weapon (which depends not only on the speed, but also the DPS). Blizzard, by normalizing instant attacks, made weapons with higher DPS more appealing, instead of making lower DPS weapons with very slow speeds the ones people want. 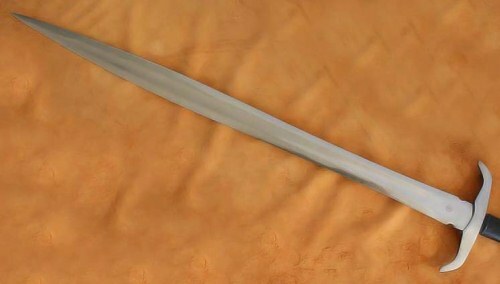 IMHO I believe this is a beautiful weapon for a fury war who can get crazy items such as Betrayer of Humanity and etc. I think this because compared to most 2h'ers it has .1 less secs speed (3.3) combined with the 45 haste = more hits which = more dmg cuz for fury wars melee hits make up a lot of their total dmg. When you enchant this weapon, it seems the glow effect only goes up halfway on the blade. I wish you could hide the glow effect like you can with capes and helmets. When it comes right down to it, this sword overall is better. Before I got it enchanted, my DPS went up by 150points from an enchanted titansteel destroyer. After the enchant, my DPS improved by yet another 300. 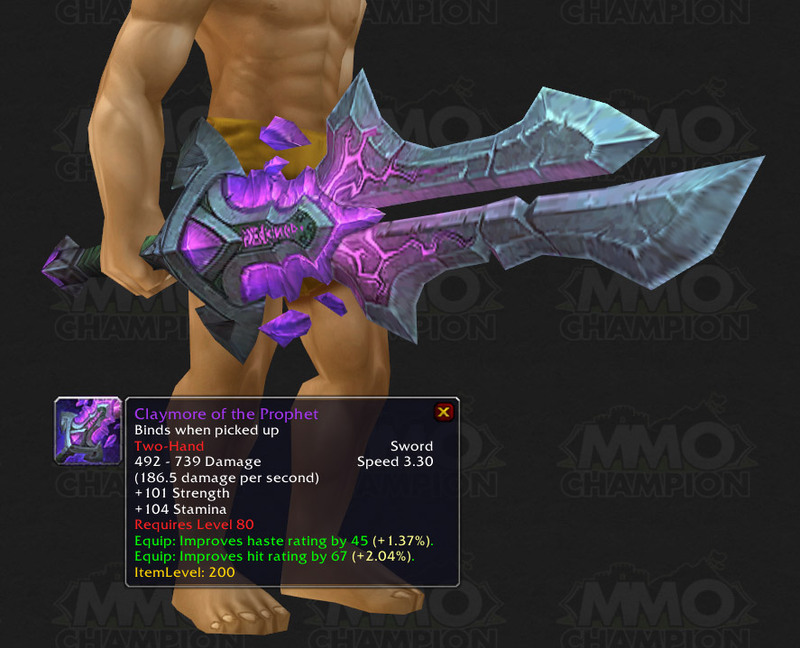 Horde version of the Claymore of Ancient Prophets. Very cool looking but it's questionable if it's worth the price. I guess it depends on if you are really interested in the other fluff items which most are. Generally it's still not worth getting over a titansteel destroyer due to the lower base damage/speed. Hit is extremely easy to max out for the 2 hander classes as a lot of gear is abundant with it, so this weapon would only be temporarily better if you are lacking hit. So for a ret pala... Is this sword better than Titansteel Destroyer ? Would this sword be appropriate for tanking, being a Death Knight ofcourse? If nothing else, I love the model so much. It reminds me of my favorite game, Fable, The Lost Chapters. Sword of Aeons, anyone? Anyone know if you can tank well as a Death Knight using this? Very disappointing that there is no 2h axe for purchase. Heh funny but so true. Heh funny but so very true! What is the gauntlet that the Dwarf in Drazex's picture was using? I just started using RAWR so I'm not sure exactly what these numbers mean or if they only apply to me in particular. I'm a fury warrior so as far as I'm reading it they are dead even. Correct me if I'm reading it wrong (with an explanation if you could please). I'm sorry, but every time I see someone using this or Claymore of the Prophet (especially in a BG, which is accompanied by mediocre gear and skill) I have to laugh. There are much better options than this available - which are also easier to obtain. Just a few examples. Good hunting. I heard on a podcast called Blue Plz that someone wished Blizzard to introduce a concept that allows for one to transfer the stats of one weapon into another (like say, turning the Hand of Ragnaros into a healing weapon by transfering the stats of the Ulduar legendary). If Blizzard were to actually implement that, I would definitely make this my weapon of choice to transfer stats to. This sword is 1 of ma favorites! I would have less problems with the Ulduar sword model, if it wouldn't have 70% of its weight in its head! I mean, normally that's the case with axes or maces, but swords have to get smaller in their blade's head. Not broader. Not necessarily, there are a lot of one hand, hand and a half, and two handed swords from history that didn't always get thinner near the tip. I have a battle-ready one hanging on my wall that's razor sharp and will cut better than most of the straight swords I have. Blizz just went a bit overboard on the size of the leaf as usual (usually its only about a 1/2 or 3/4 inch bulge in the middle but somewhat toward the tip.) It makes the sword heavier to swing but also gives the blade a curved cutting edge and more weight behind the swing. Leaf-bladed swords emphasize cutting over thrusting, so its beneficial for them. An example this one is pretty close to the shape of mine, mine is just sharpened. So the model on it isn't bad, just exaggerated. For people who are trying to get this beautiful weapon but have never done the Argent Crusade stuff, it takes exactly 7 days to get it. 1. First of all, you need to run Trial of the Champion dungeon on HEROIC everyday in order to get this as fast as possible. The Heroic version gives you 1 Champion's Seal per boss, so you will get 3 seals per day. Yes the first boss is a pain to solo, but kiting properly at the right time, you can avoid the stampedes and attack with ranged abilities. After this boss has been defeated, the next two bosses should be a cakewalk. 2. Next, is to do the Argent Crusade dailies you get from your faction's camp in the Argent Tournament. For the first three days, you'll be sent on quests to get 5 Aspirant's Seals per day (and 15 in order to move on with the quest line). 3. After collecting 15 Aspirant's Seals, you'll be sent again in similar dailies to get 25 Valiant's Seals, 5 per day again. 4. On the seventh day, if you have done all the dailies everyday and ran ToC (H) you will have 21/25 Champion's Seals. Now, for the last 4 Champion's Seals, you have two options, you can either (A) Do the Black Knight quest line (which rewards you with 10 Champion's Seals and a pet in the end), should only take about 30 min for a level 90, or (B) Do the new Argent Crusade dailies offered to you that gives you 1 Champion's Seals (2 if you choose Champion's Purse for the reward). 1. Pop Army of the Dead right after you kill the last group of the small trash mobs that enter the ring with the Champions. 2. If you have the level 90 talent, Desecrated Ground, you can just stand still and hit the bosses little by little (usually takes 5~10 min as a full geared level 90). 3. When kiting, Howling Blast tends to be a perfect skill to spam, due to its diseases spreading and can damage all three champions at once. I remember this sword having something around 770 damage. Maybe I'm thinking about something else, but whatever. I really like this sword, but I can't find a set to xmog with it. Could anyone suggest a set? This is bull#$%^ the alliance sword looks heaps better then the horde sword Blizzard always favor the alliance. Does not get added to the account-wide wardrobe system for transmog. It seems you need to actually buy the item on the character you plan to use it on. Adding this to my appearance collection also unlocked Claymore of the Prophet for my alliance characters, which is a very nice bonus. February, 2018: Still the most beautiful sword in World of Warcraft. This item will be converted to Claymore of the Prophet if you transfer to Alliance.